Multihulls Turkey, situated in the heart of Marmaris, is at the center of the catamaran industry in the Med. TMC Turkey is managed by associate broker Feride Demir, who is ready to assist with all of your cruising needs. Feride was born and raised in the seacoast town of Kusadasi, Turkey where the yachting industry is a major aspect of daily life for residents. With a large harbour and marina, and some of the biggest and most beautiful cruising ships visiting the area, boats haves always been a part of Feride’s day to day life. 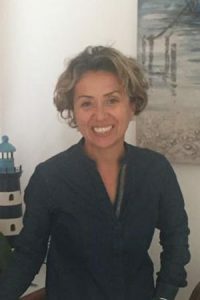 It was natural then for Feride to begin her career in the yachting industry in 1998 where she oversaw project management for a Yacht Technical Service company and its team of workers. In 2001 the company moved from Kusadasi to Marmaris which has four of the largest marinas in Turkey. In 2006, Feride decided to concentrate on the yacht brokerage side of the business. After her first sale, she knew that she was perfectly suited for the position. With her experience on the technical side along with her customer relations background, she was able to provide a unique experience for clients in the Mediterranean with their buying and selling experiences. In a few years it became clear to Feride that she had outgrown her current company with the volume of her brokerage business and needed to expand her efforts and focus entirely on the brokerage business. She now joins The Multihull Company to open TMC Marmaris and assist clients with all of their buying and selling needs in the Med. With offices situated in the center of Marmaris and within close proximity to all of the major marina and facilities, Feride is ideally located to assist in the purchase or sale of your next catamaran. If you are shopping for a boat in the Med, or looking for assistance with the sale of your boat in Turkey, Ms. Demire is ready to assist! As the world’s largest truly global brokerage company specializing in catamarans and trimarans, The Multihull Company is ready to assist you if you wish to buy or sell a multihull in Turkey, or anywhere in the Mediterranean.